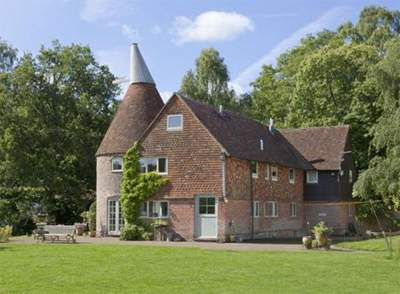 The Oast House is a well-presented property with perfect accommodation for a family just six miles from Sevenoaks in Kent. Set in a private position, the interiors are finished to an extremely high standard with oak and limestone tiled flooring, an ornate iron staircase and three-quarter length windows, as well as exposed wall and ceiling timbers. The drawing room occupies the largest roundel, while the dining room and playroom are in two of the smaller roundels, while the sitting room is open to the large kitchen and has pretty views out to the garden. The master suite is very comfortable, and offers an excellent, modern fitted bathroom with a roll-topped bath. Four further bedrooms are located in roundels – two have paddle staircases up to a mezzanine level providing additional accommodation. There is also a family bathroom and a well-appointed shower room. Outside the gardens provide a tranquil setting and are mainly laid to lawn with mature trees and shrubs around the perimeter. A paved terrace leads down to the duck pond which has water lilies and reeds. The Oast House is situated around half a mile outside Hildenborough (which has trains to London), and six miles from Sevenoaks in Kent. The guide price is £1.395m. For further information please contact Savills on 01732 789 700 or visit www.savills.co.uk.